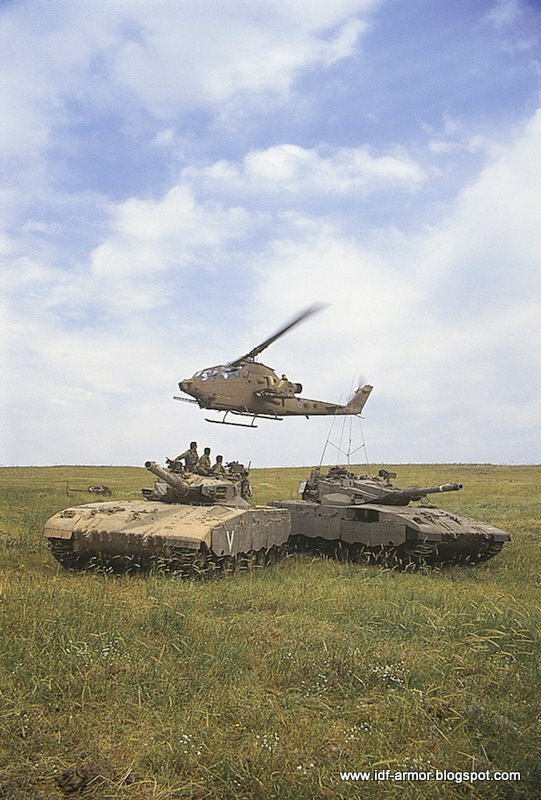 The Israeli Armoured Corps is arguably the most experienced armoured forces in the world being involved several conflicts with its hostile neighbours. 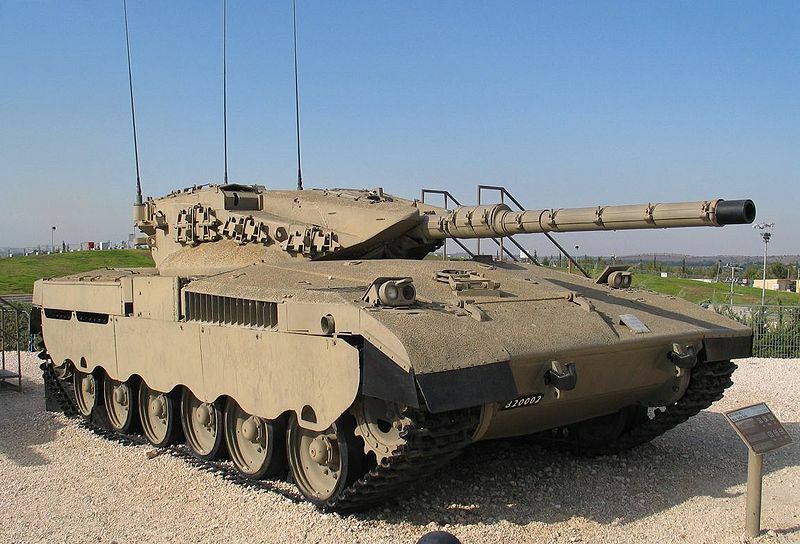 While initially buying their tanks from whatever sources they could find, the Israeli’s found their requirements to be different to the tank designs from around the world and eventually set about designing their own tank with more focus on crew protection as opposed to mobility, so the Merkava was born. 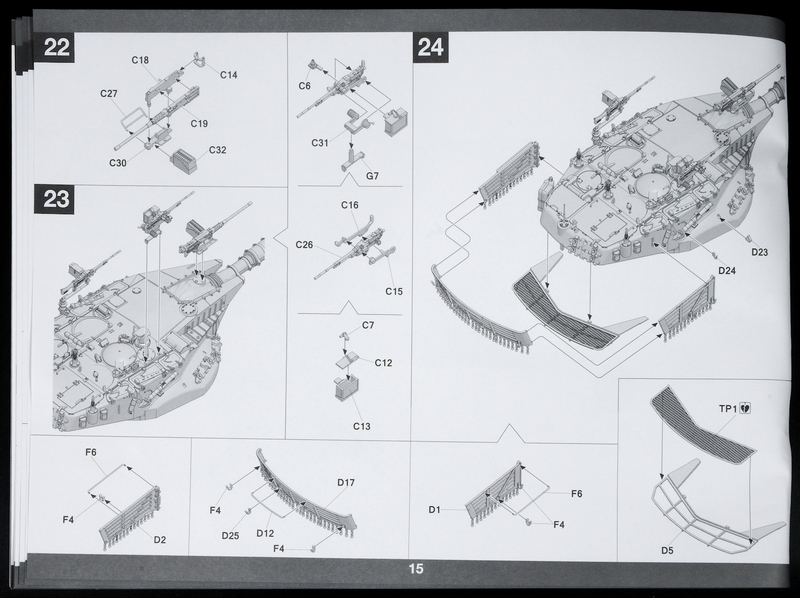 Mounting the M68 105mm gun, the biggest difference between the Merkava and other contemporary designs was placing the engine at the front as a degree of extra protection for the crew compartment behind it. 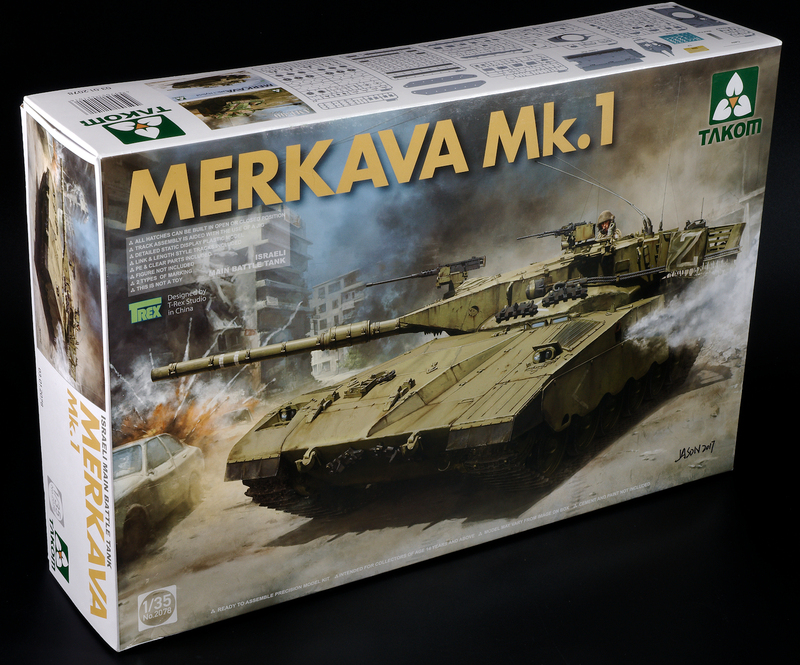 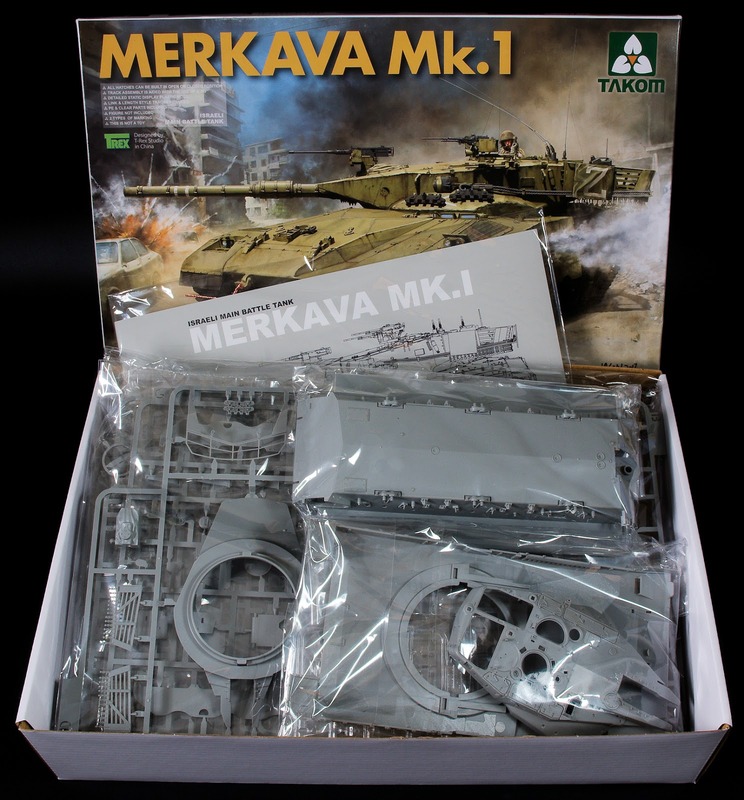 While other manufacturers have released newer marks of the Merkava, it has been an age since Tamiya released their Merkava, so it was good to see Takom coming out with new kits of the original Merkava. 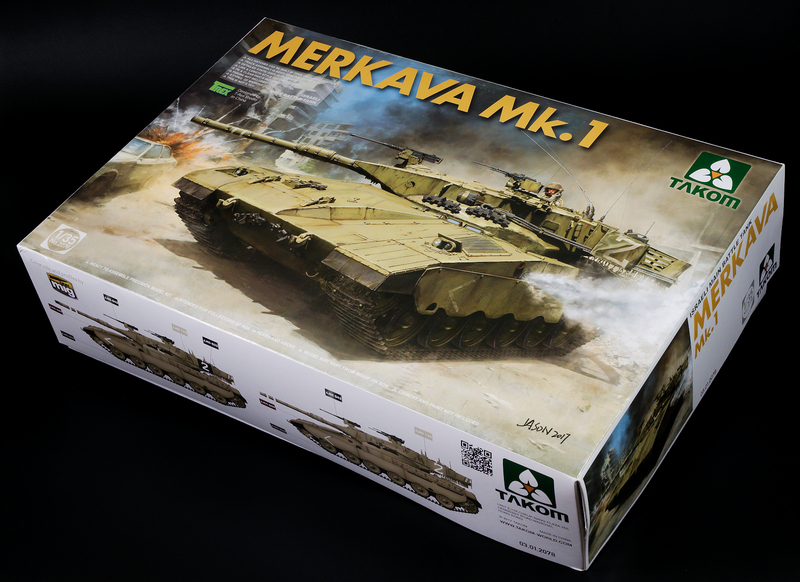 The kit comes in Takom’s standard sized box and while full, is not at bursting point like how some other manufacturers pack their boxes. 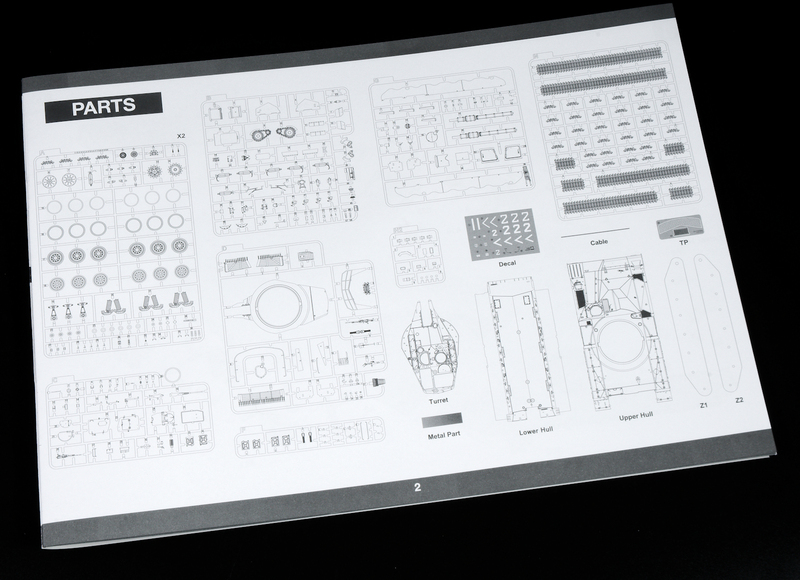 Each sprue comes individually bagged except for the duplicate sprues which is always good for protecting them from damage. 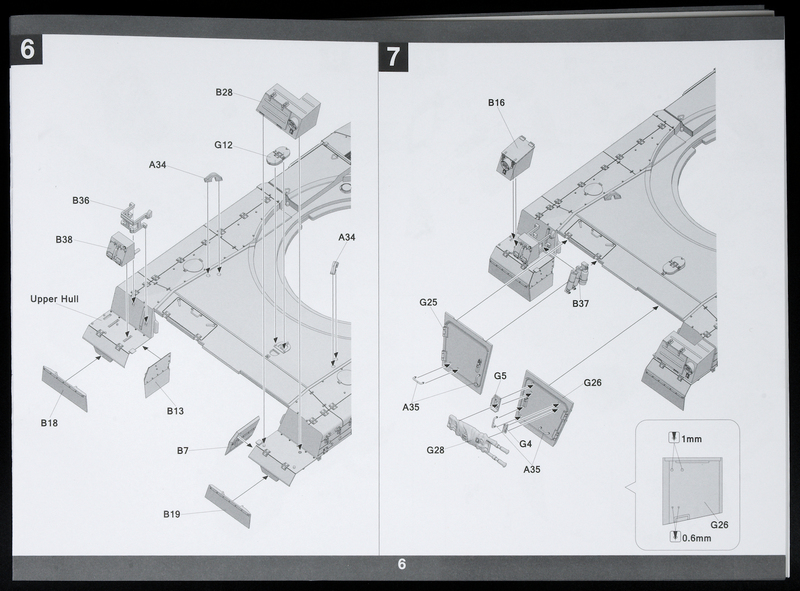 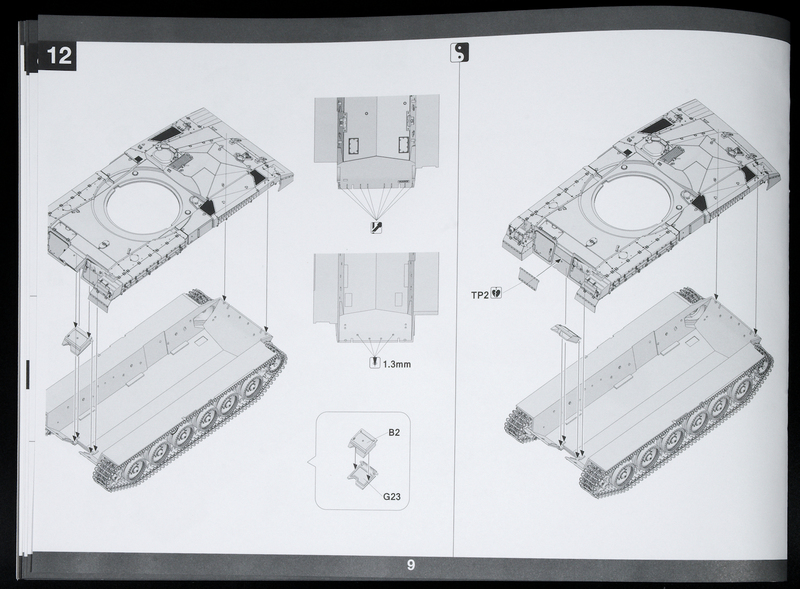 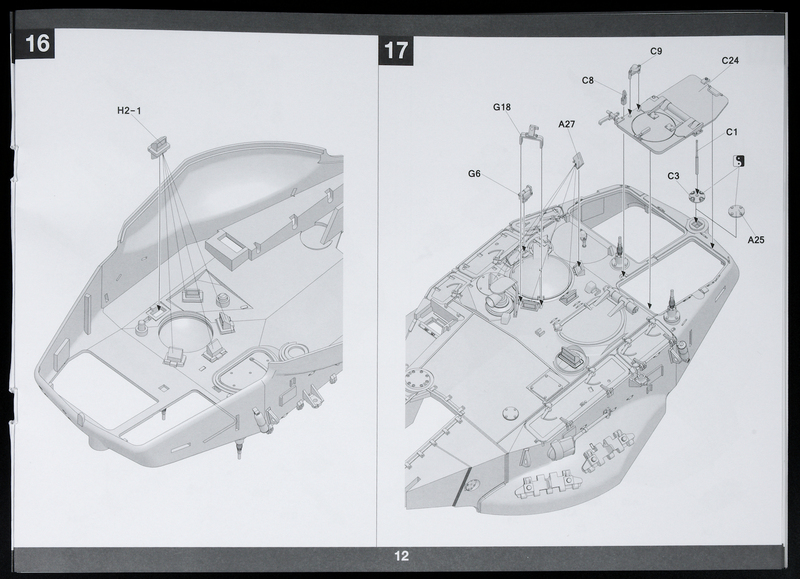 The instruction booklet comes in Takom’s usual landscape booklet with line drawings. 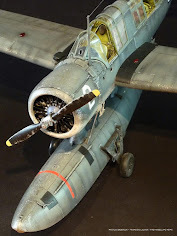 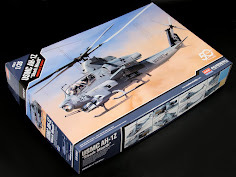 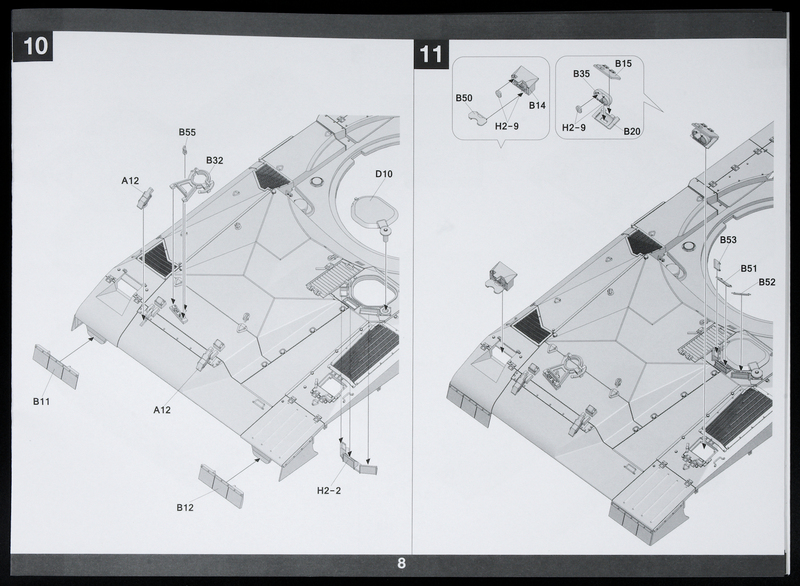 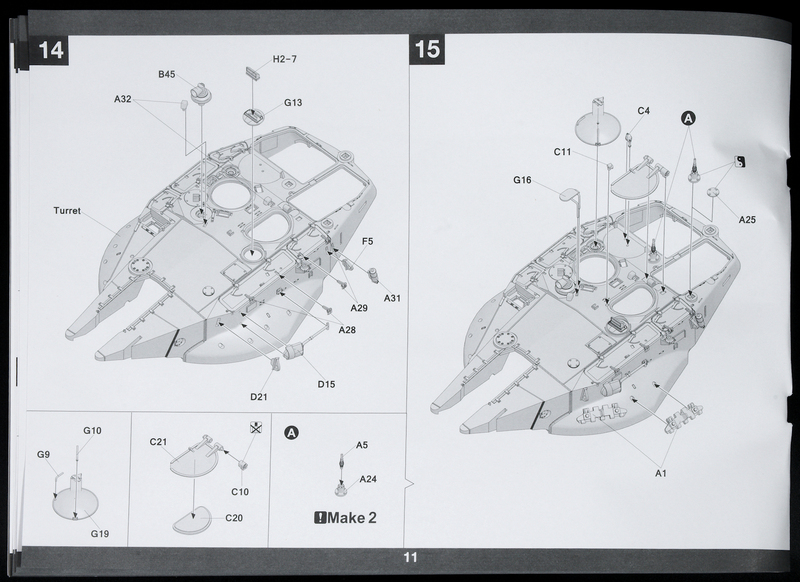 I found the instructions to the earlier M47 to be a little lazy in places so I’m interested to see if they have improved with this release. 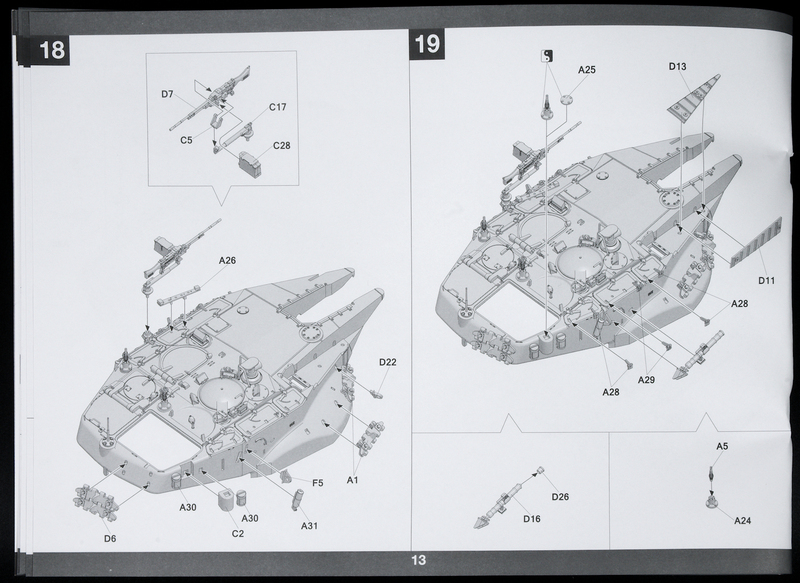 Two colour profiles are provided at the end of the instruction booklet with paint suggestions using Mig Ammo paints. 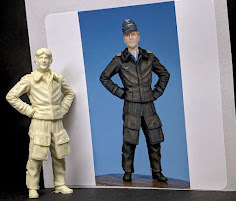 Both profiles are pretty much the same with overall IDF Sand Grey, and both using the number two but in different fonts, which I thought is a bit of a letdown. 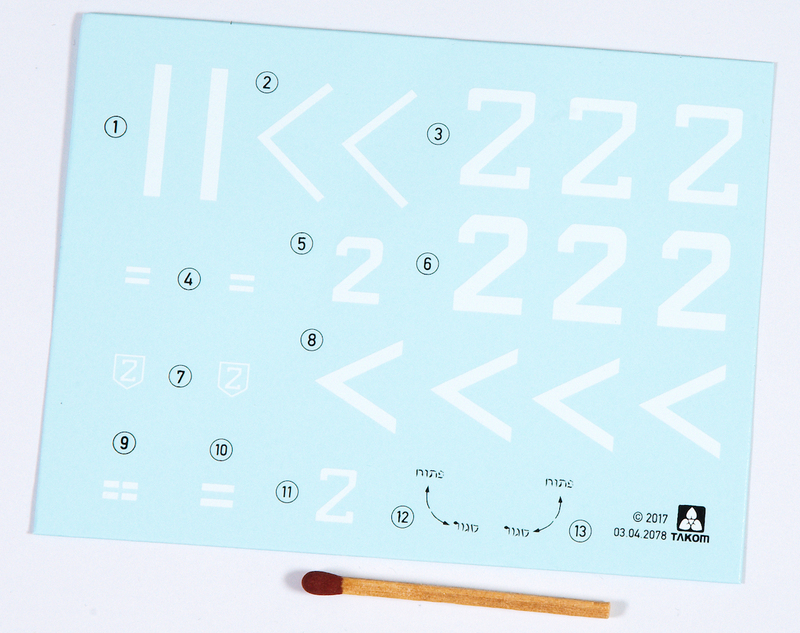 The small decal sheet is nicely printed with some chevrons and the number two’s in two different fonts. 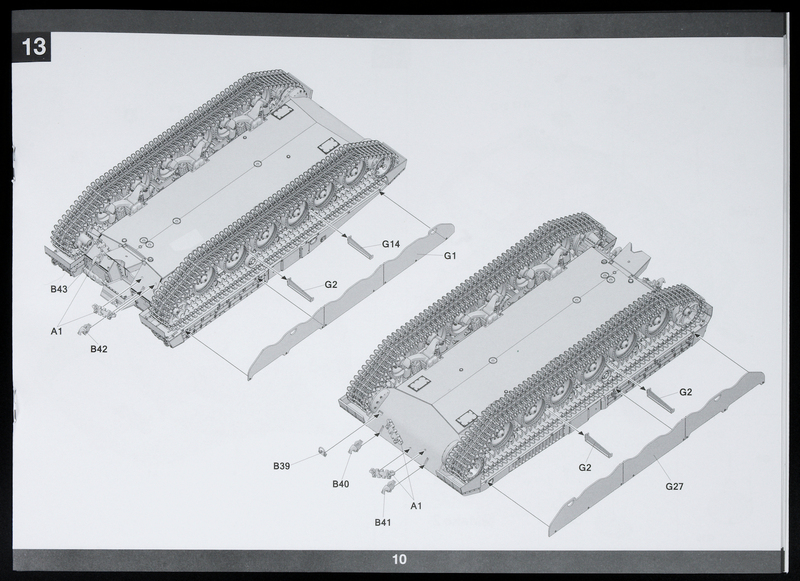 A small photo etch fret is used for the rear turret basket, and a small sheet of lead (I think) is provided for the turret numbers to go over on the turret basket. 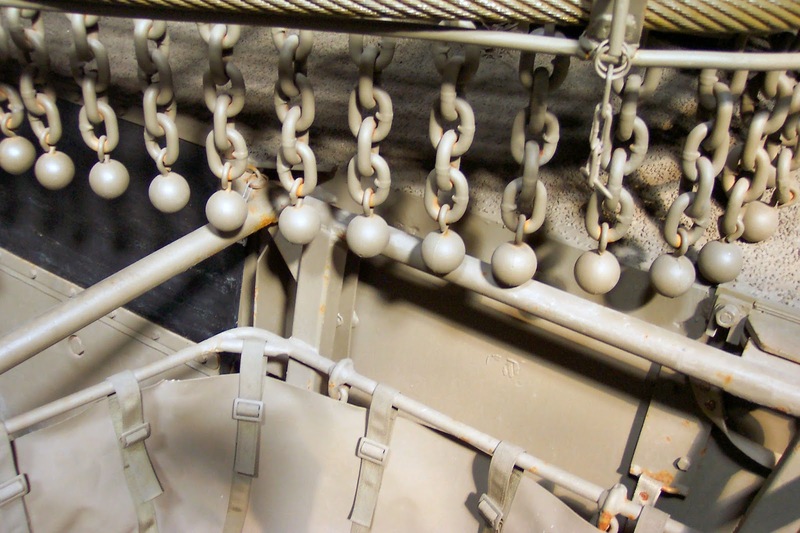 A length of wire is also provided for the tow cable and is very malleable. 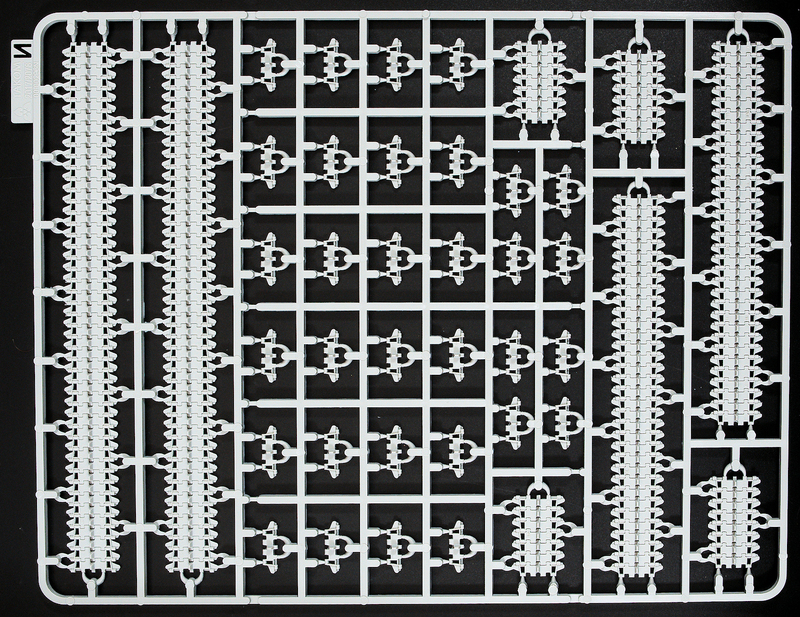 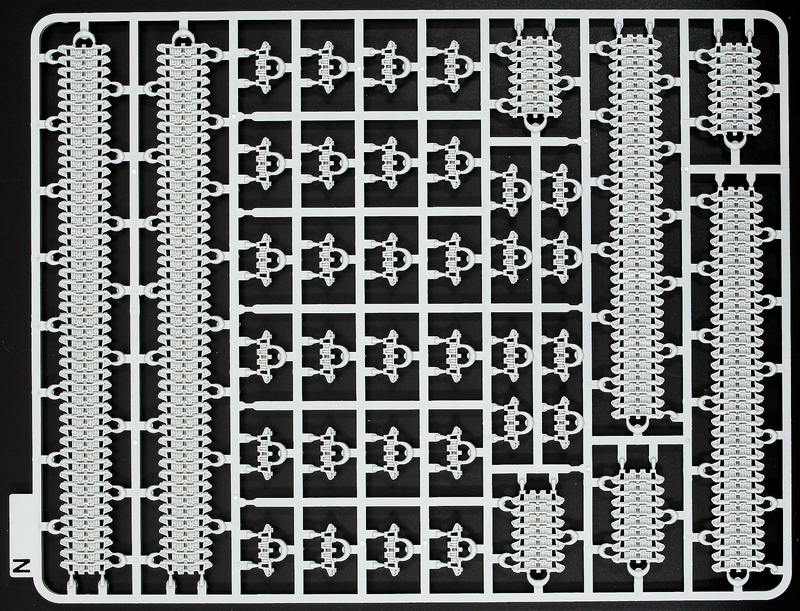 Sprue A is the standard duplicate of the running gear and is moulded in the typical Takom style which is moulded with precise detail with no noticeable flash. 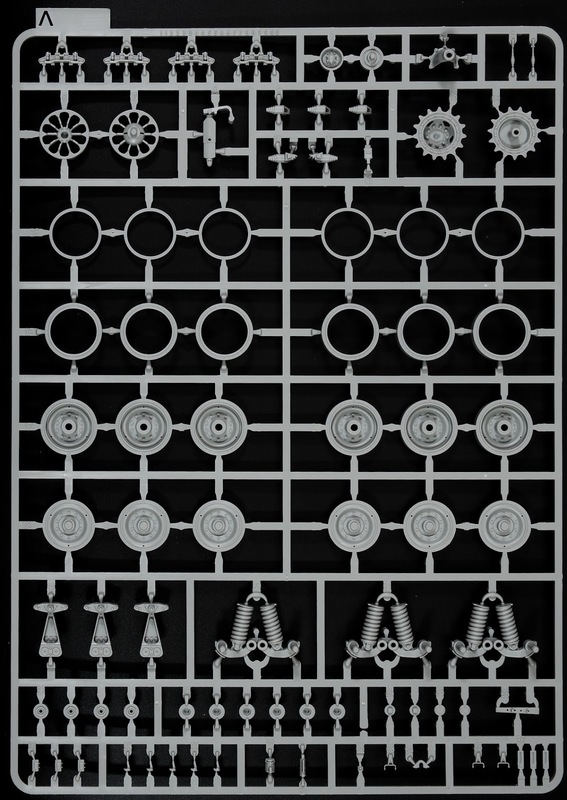 Details such as the bolt heads are the right shapes, and foundry numbers are moulded on the sprue runner for you to scrape off, although I couldn’t find where they don’t appear to be mentioned in the instructions. 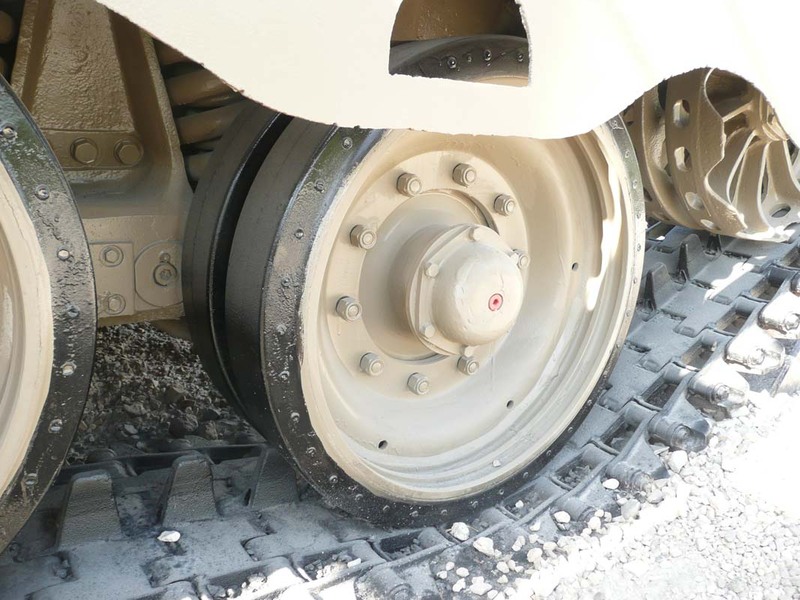 The inside wheels are moulded in one piece, but outside faces come with separate tyres to make painting easier. 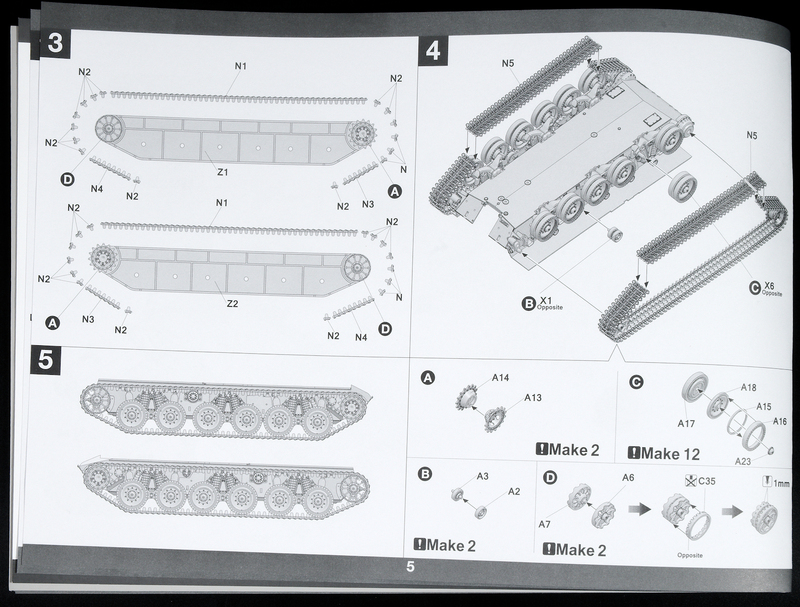 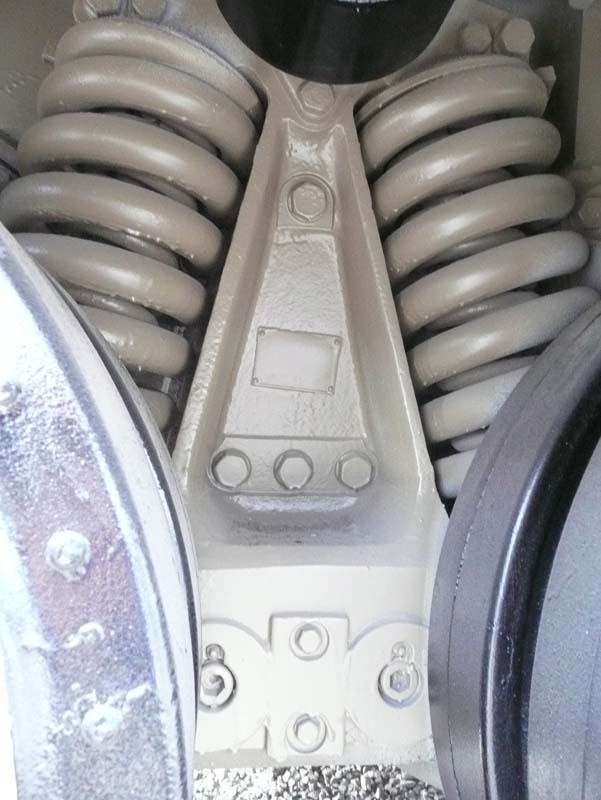 The coiled springs of the suspension have minimal injection contacts so the cleaning up of these parts is hassle-free. 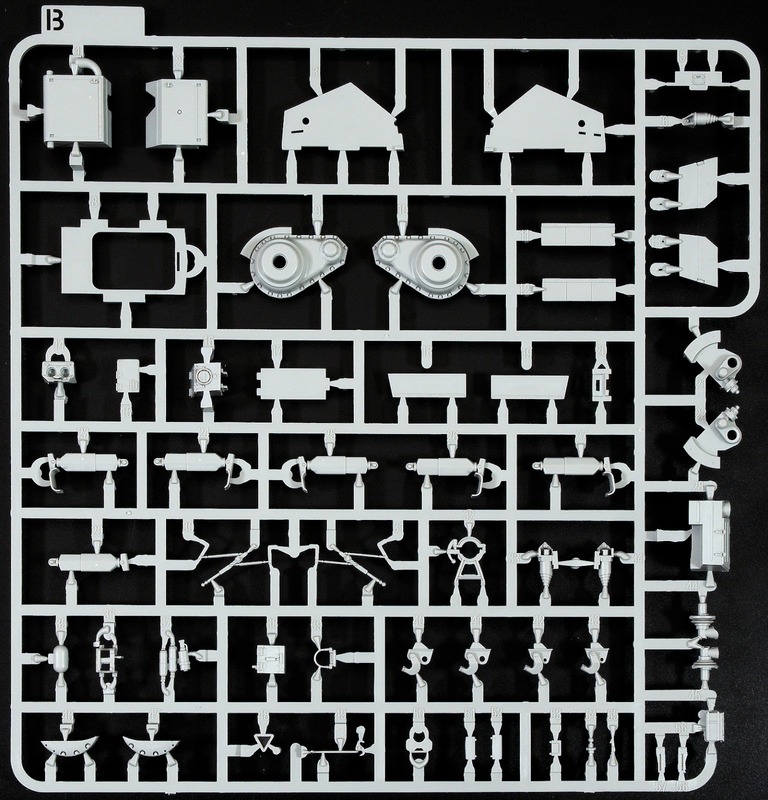 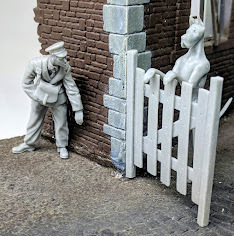 Sprue B is an assortment of details on the lower hull and once again feature very sharp detail in the moulded parts and assorted details. 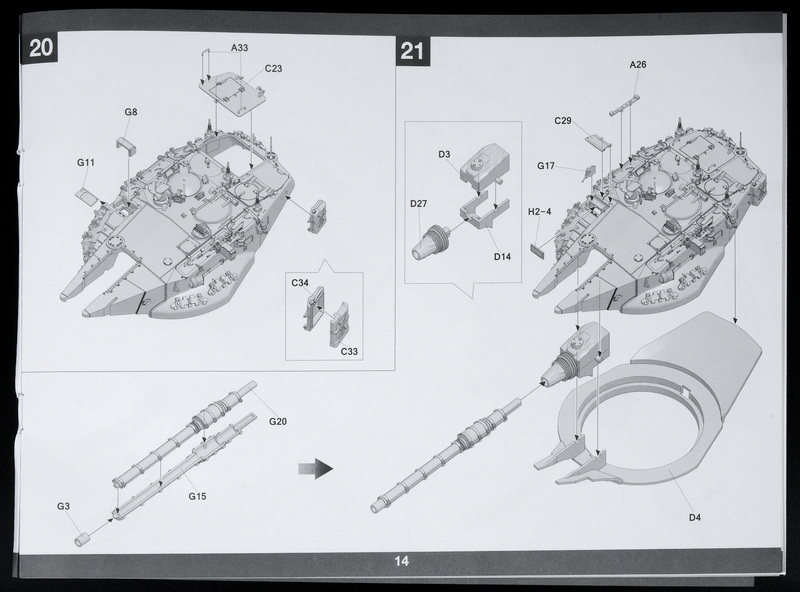 Sprue C is again an assortment of details including some of the larger hatches and machine guns. 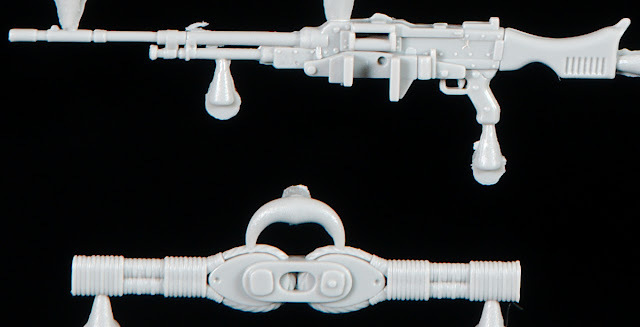 The M2 machine gun is provided in two pieces and looks to be well moulded although the end will have to be drilled out. 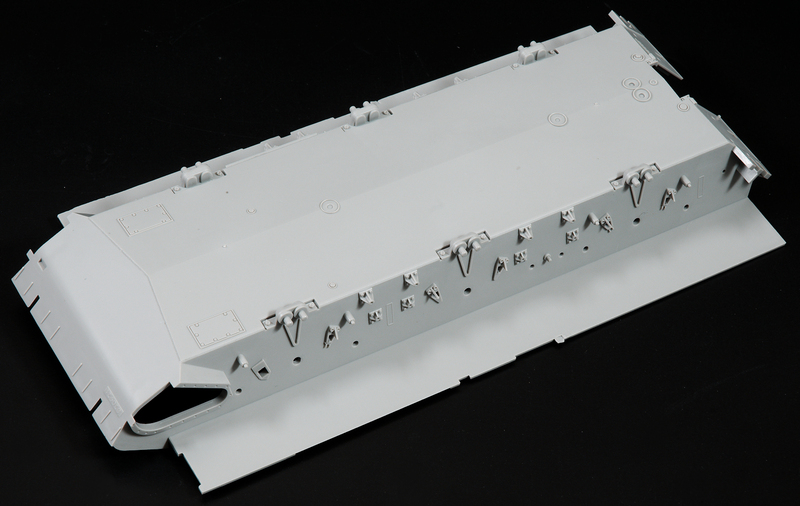 The ammunition box for the M2 is moulded with the ammunition inside and should come out nicely with a bit of paint. 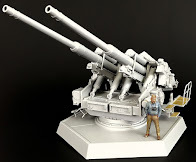 The GPMG is also very well moulded although take care with the end of the barrel because it can very easily be mistaken as part of the sprue. 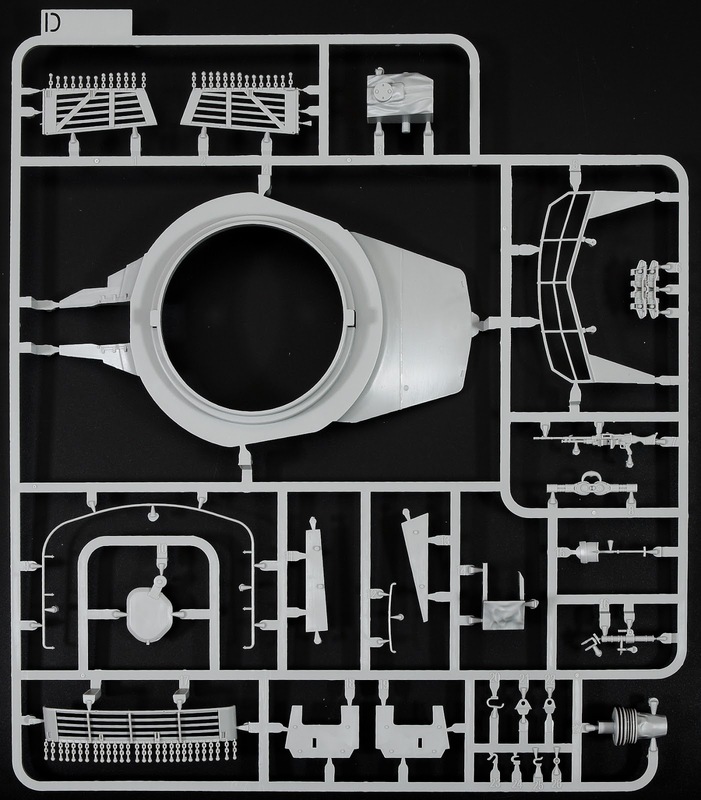 The D sprue comes with the lower turret half and other details for the turret including the turret baskets. 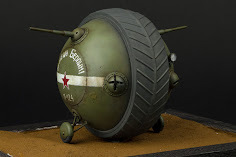 The turret basket is moulded with the ball and chain armour in place although it does look a little overscale, that is about the best that can be achieved with plastic moulding without resorting to metal. 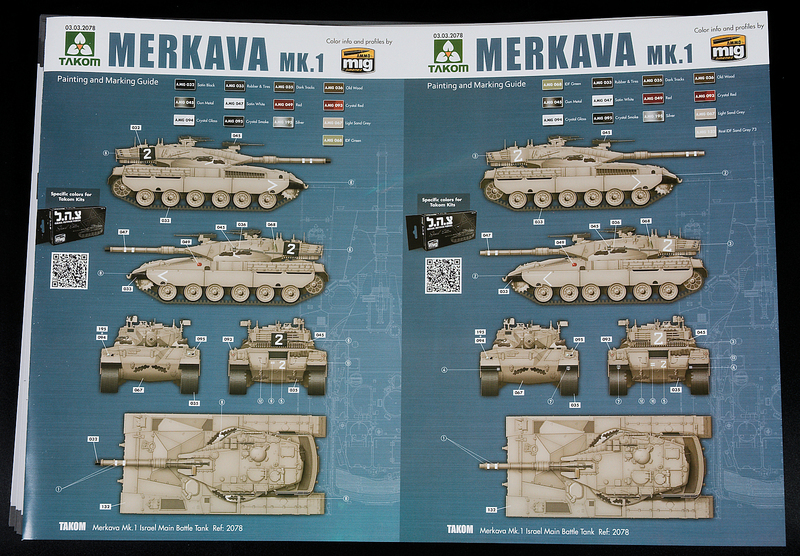 However, the ball and chain armour were retro-fitted to the Merkava 1 after experiences in the Lebanon War, so you will need to decide whether you want to keep it or not, but I think Takom have made the right choice with removing the details to be much easier than adding it. 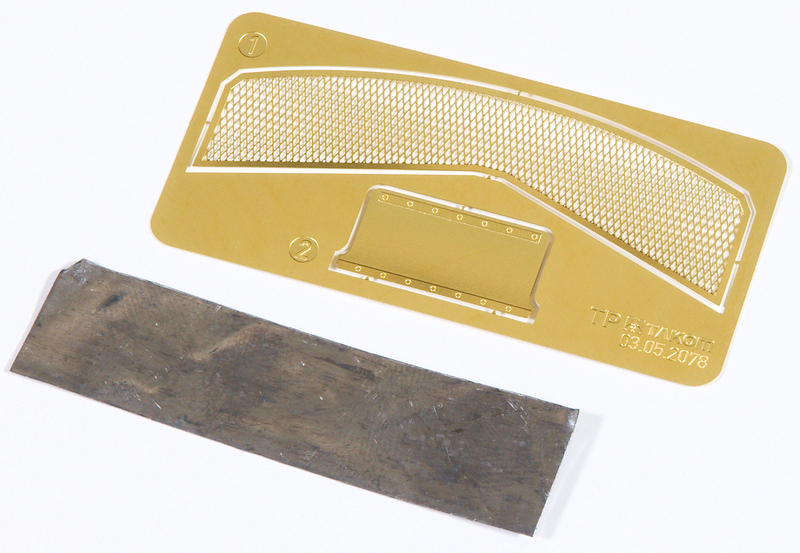 Included on this sprue are the entrenching tool or "shovel" as one might call it and the aerial mount in a boot of material. 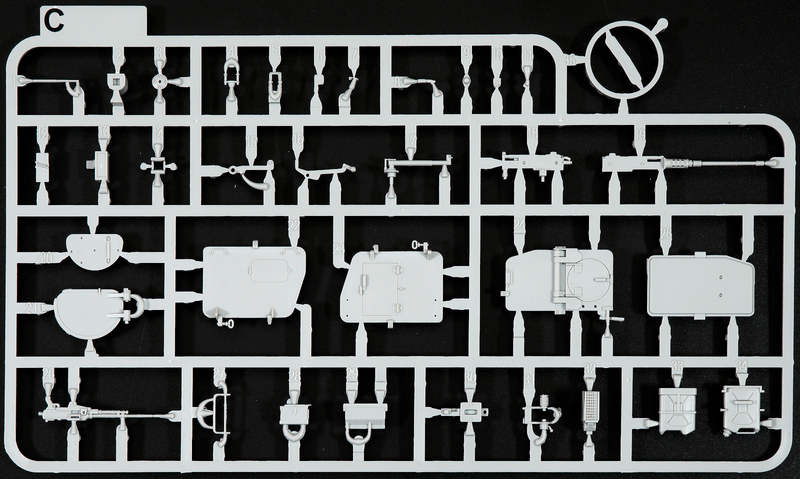 Sprue F is a smaller sprue with fuel canisters, tow cable ends and some other details. 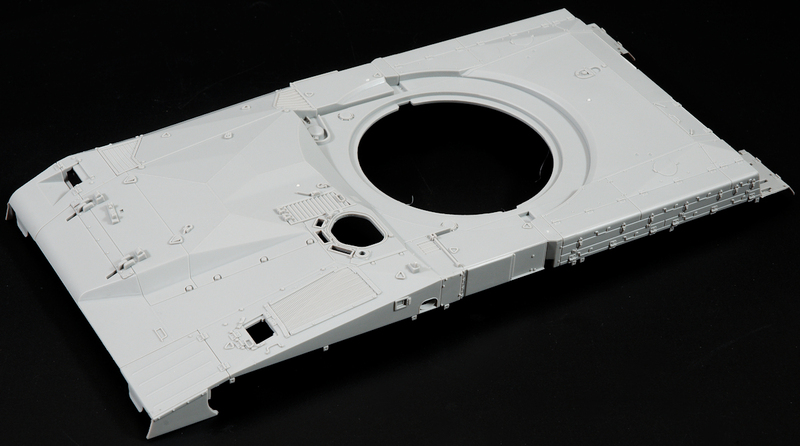 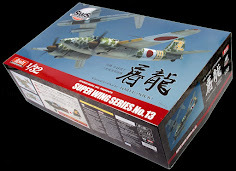 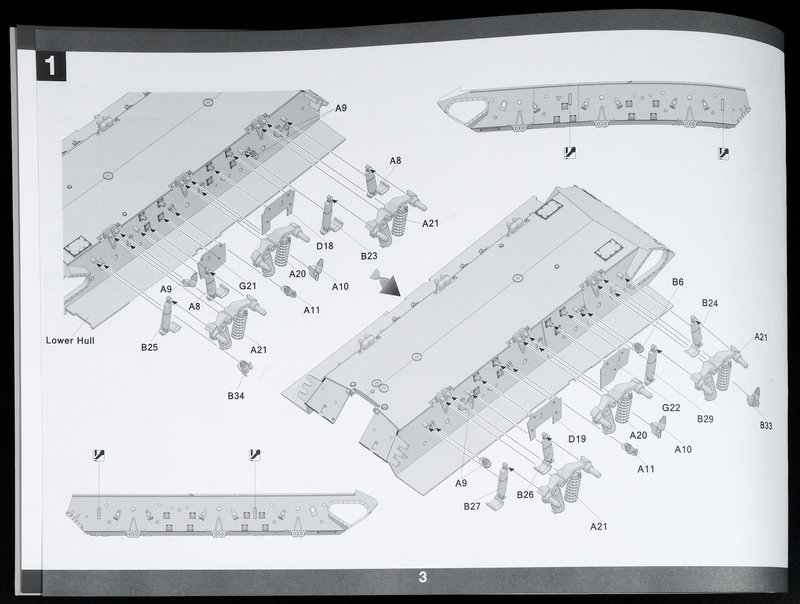 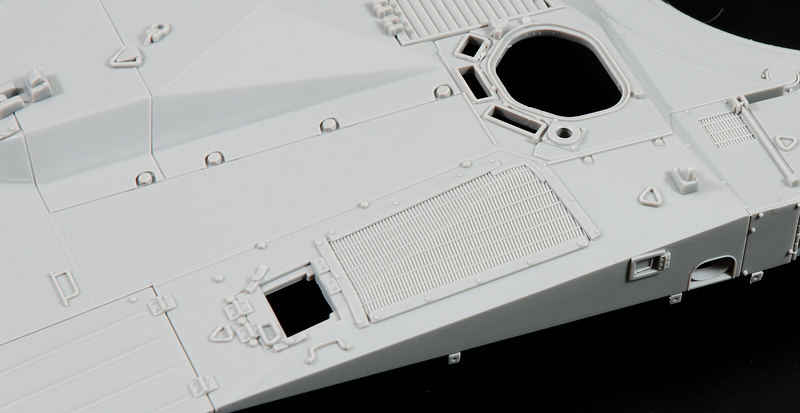 Sprue G comes with the side skirts which are moulded in one piece, as well as the main armament. 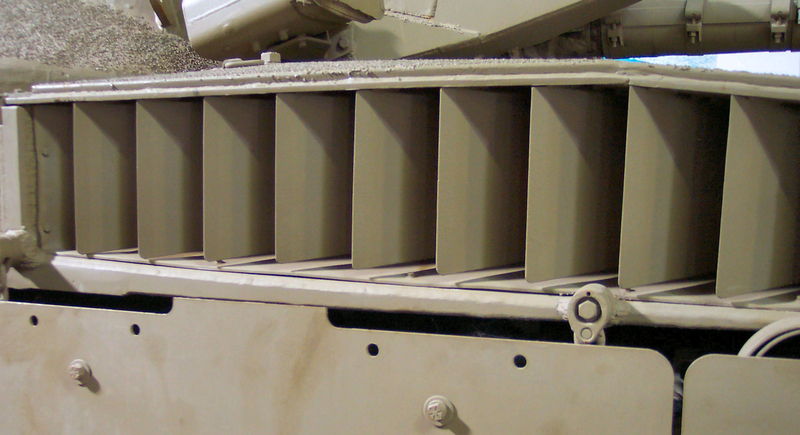 The main armament comes in halves with a separate muzzle, and clean-up is comparatively easier than normal barrels with the flat sections on the top and bottom of the barrel. 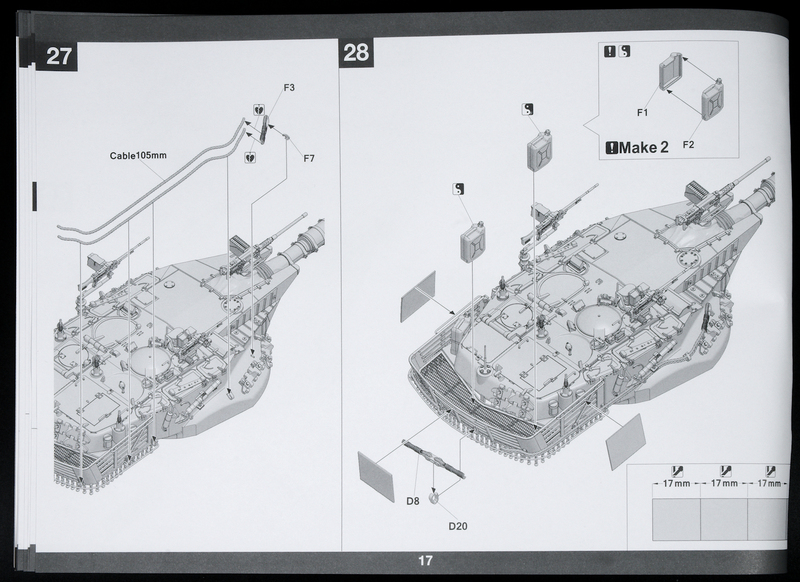 The upper hull illustrates how big the Merkava actually is and comes moulded in one piece. 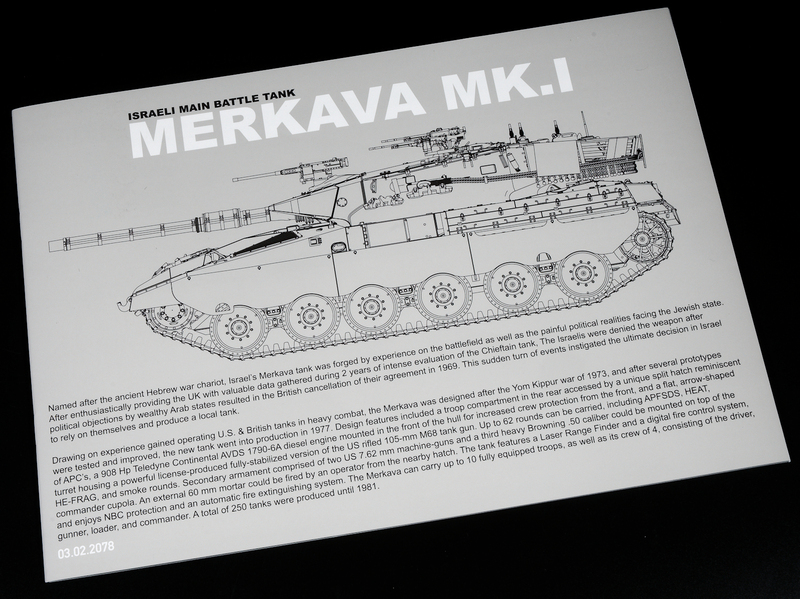 There is no non-slip texture moulded on, and is another detail that was retrofitted to the Merkava Mk1. I wasn’t able to find out when the non-slip was applied so can’t be sure if tanks with the retro-fitted ball and chain armour should have it or not so that is a decision for you to make. 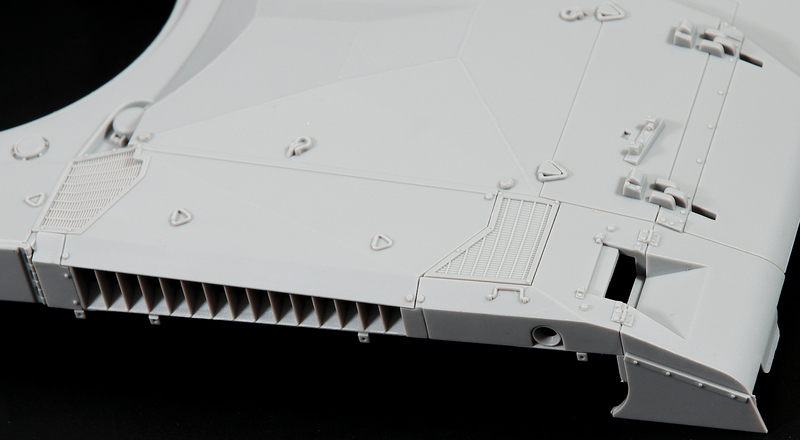 The exhaust vents are nicely moulded on the side of the hull, although you might want to put something behind it to stop you from seeing through the empty shell. 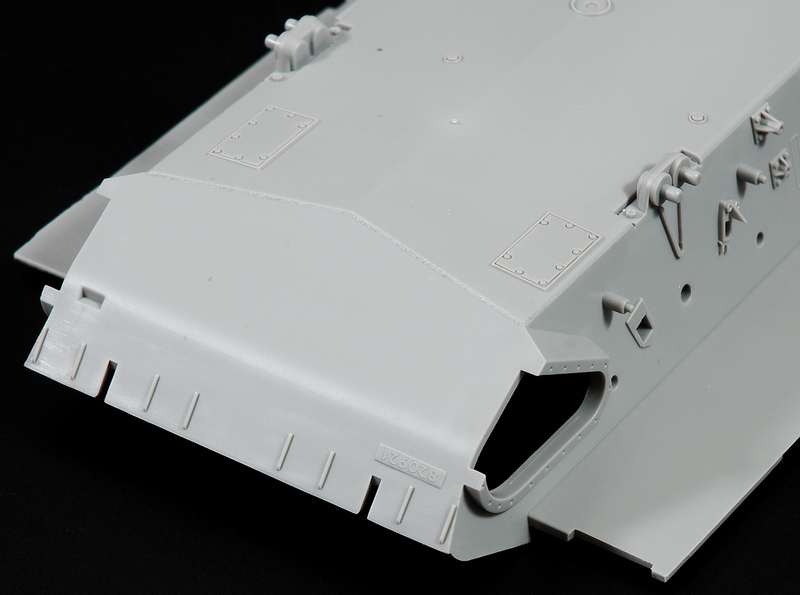 The flap moulded on the side of the forward fender is quite annoying and will get in the way of my usual method of installing the tracks by sliding the complete runs over the inside wheels and then installing the outside wheels. 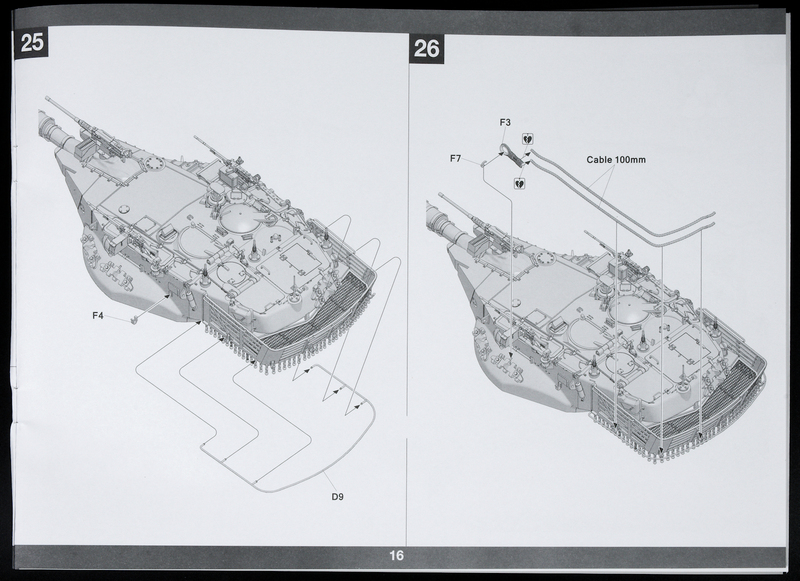 This means you will have to install the tracks before you close up the hull. 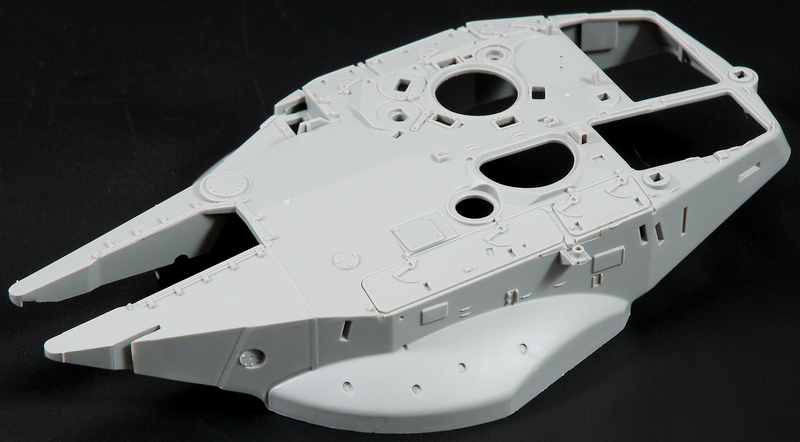 The lower hull comes in a single piece and is well moulded so there should be no alignment problems. 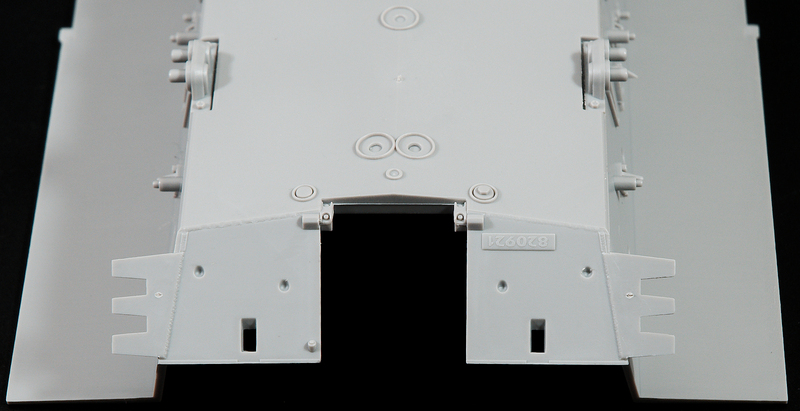 The tracks are of the link and length type although upper runs will be hidden by the side skirts. 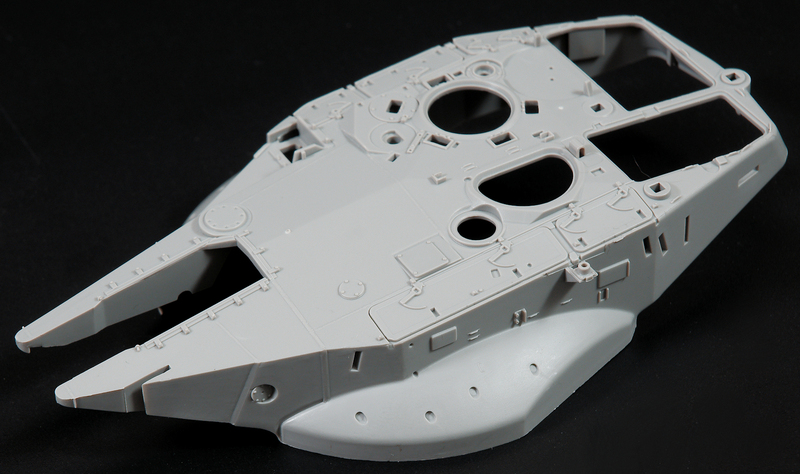 The detail is nicely moulded on both sides although there are some small ejector pin marks on the inside faces. 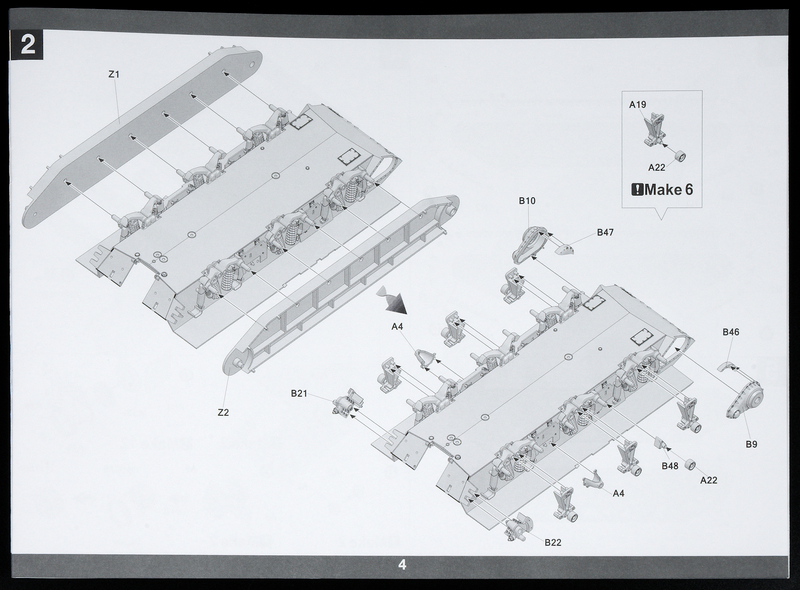 A pair of jigs is also provided to help with construction of the tracks. 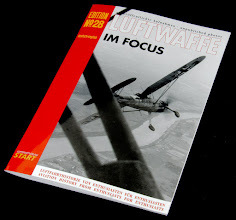 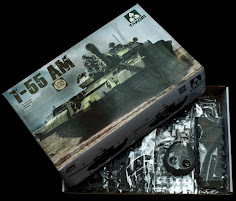 I did find them a bit tricky to use with the M47, but that was possibly because I didn’t follow the instructions so I will try to learn from that lesson this time. 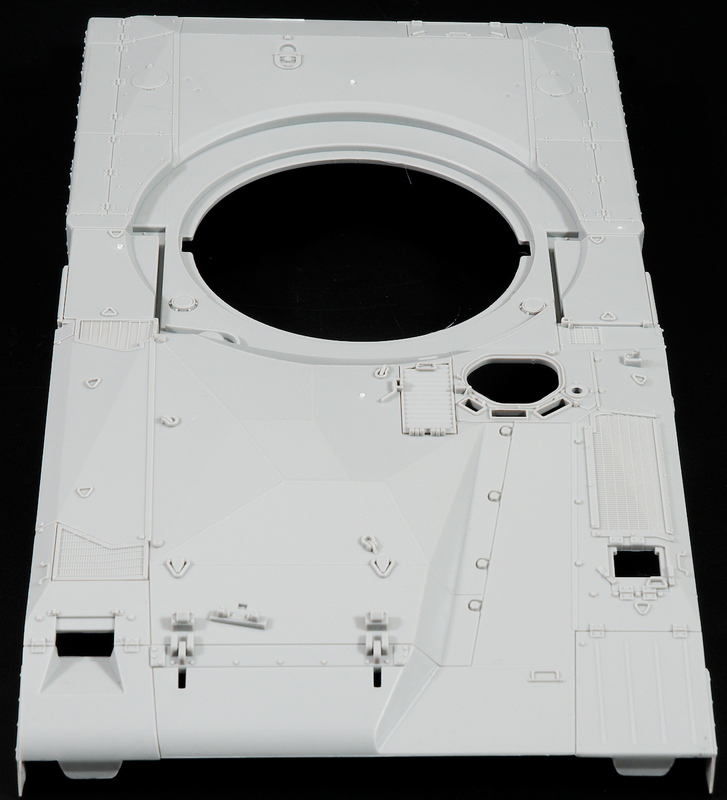 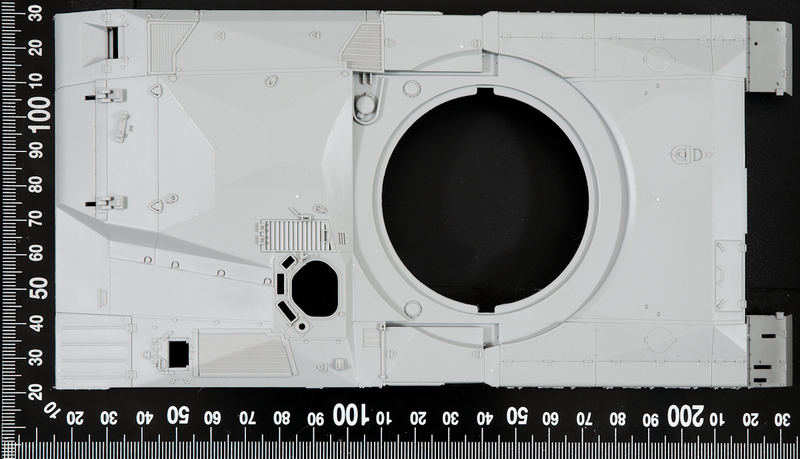 The upper turret shell with its distinctive pointed front is actually quite a slim design compared to other MBT turrets and comes in one piece and again nicely moulded throughout. 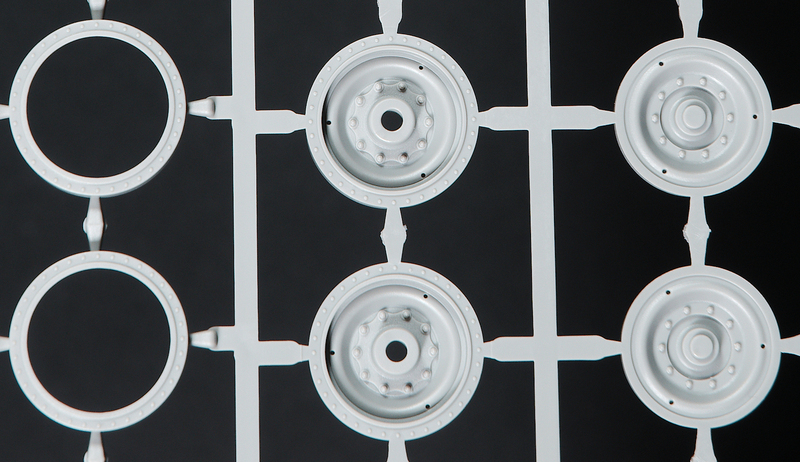 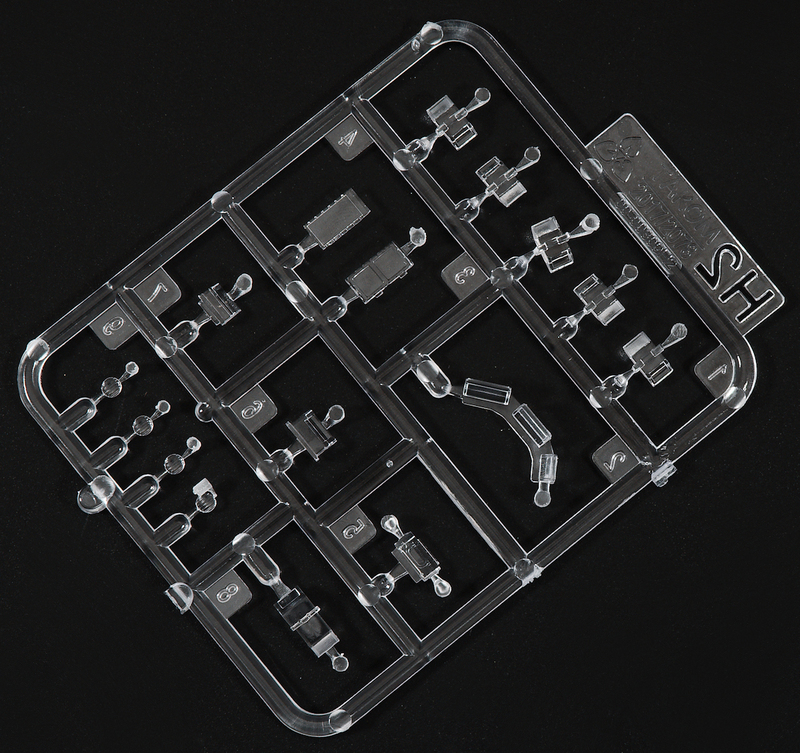 The small clear sprue comes with the usual periscopes and lights and is clear and distortion free. 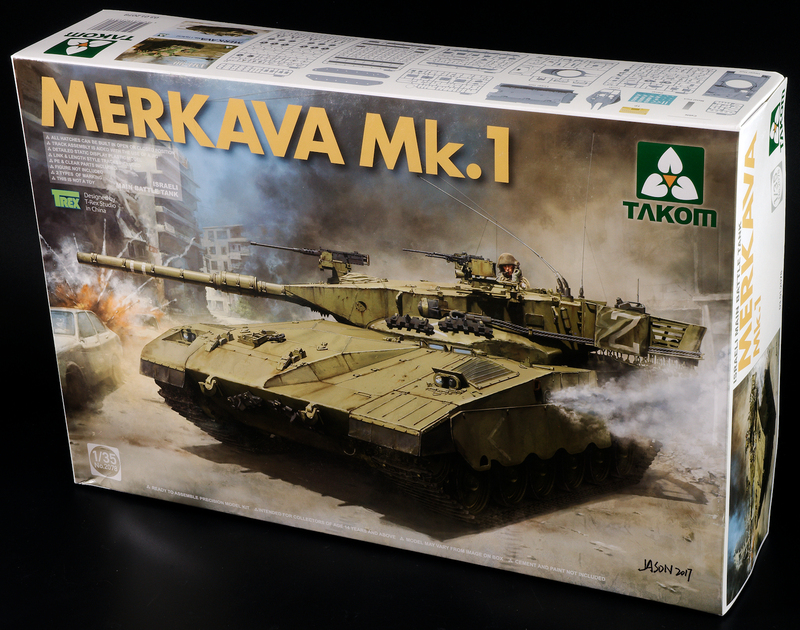 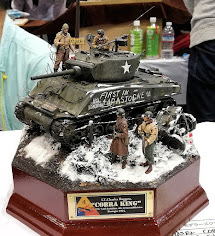 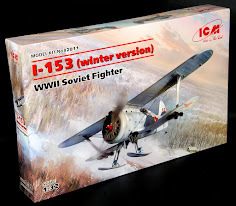 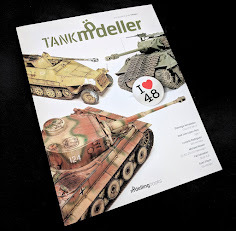 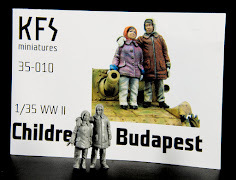 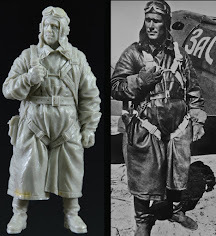 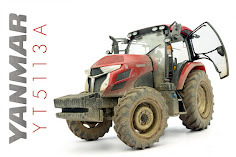 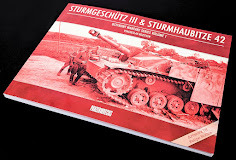 I’ve built several kits by Takom now, and will say that I really do enjoy building their kits. 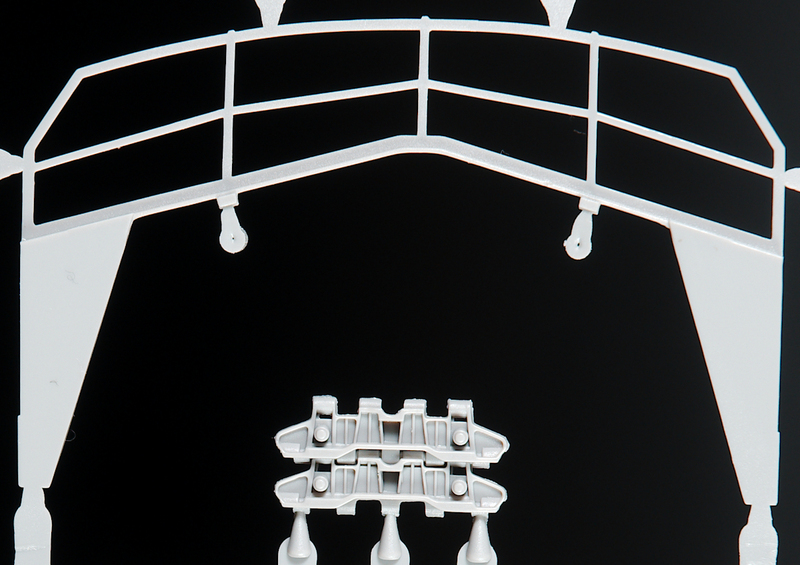 This one looks to be a beauty, and if it is like their previous kits, then this will be a gem too. 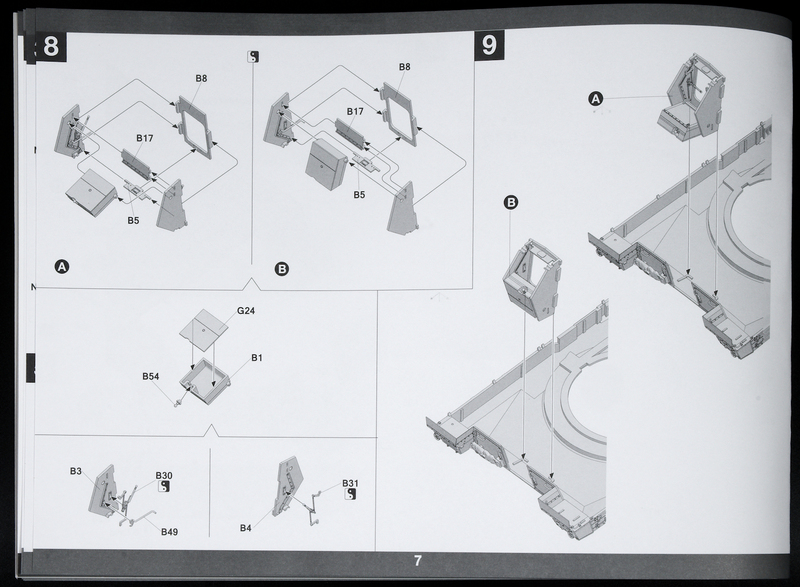 Keep your eyes peeled for the build.